Home / Preview / Rock / Shakin' Stevens / Shakin' Stevens Announces New Album, "Echoes Of Our Times"
Shakin' Stevens Announces New Album, "Echoes Of Our Times"
Platinum-selling Shakin’ Stevens will release his twelfth studio album, Echoes Of Our Times, on September 16. Known as an entertainer and performer, with 33 hit singles and 4 UK number 1's to his name, this new record clearly marks Shakin’ Stevens out as an artist, songwriter and storyteller. Echoes Of Our Times grew from Shaky’s realization that, like most of us, he knew so very little about the background of his family, the stories of his ancestors’ loves and lives lost, and their struggles to survive. Research revealed tales of poverty and strife in the Cornish copper mines, of bravery and loss in war, of philanthropic preachers and stoic Salvationists, of children suffering and of family secrets and feuds. These uncovered stories became the inspiration for many of the songs that make up this collection. Having touched on most styles of music during his career (including blues, rhythm & blues, country and Cajun), the new songs were in fact a big departure for Shaky. “I have never before written a song that is so personal. Some of the tracks directly relate to stories and situations about my family past, while others are more of a social comment relating to the world that my ancestors, and we, live in” he explains. The album gave Shaky the opportunity to experiment and use instruments that he has previously used on stage but never before on a recording. Each story set the scene for the music and dictated which instruments were used. Down in The Hole features harmonica, Dobro guitar and harmonium to capture the feel and provide the atmosphere, hence it has elements of folk, rock and swampy blues. 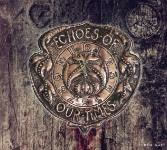 Keeping the harmonica and adding banjo, flute and military snare, gave a sound that was reminiscent of the past, helping to paint a picture for the title track Echoes Of Our Times, by joining folk rock with delta blues. The song Behind Those Secrets And Lies was no exception. Every family has at least one secret, or more, somewhere, and by its very nature this song dictated the need for a very dark and mysterious feel. The cello and bottleneck guitar, coupled with the acoustic guitar figure, in a minor key, provides that haunting backdrop to guide the listener through the sadness of the lyrics. By contrast the anthemic rock of Last Man Alive, with its rousing mix of guitars, brass and piano - an infectious blend of instruments - provides a welcome lift to close the album. The album was recorded at Berry Hill Studios, produced by Shakin' Stevens and John David, who also engineered.